BERKELEY – Increased turbulence and storms first observed on Jupiter more than two years ago are still raging, according to astronomers from the University of California, Berkeley, and the W. M. Keck Observatory in Hawaii, who snapped high-resolution pictures of the planet earlier this month. Captured with NASA's Hubble Space Telescope (HST) and the 10-meter Keck II telescope, this so-called "major upheaval" on Jupiter involves stunning changes in the planet's atmosphere, said lead astronomer Imke de Pater, professor of astronomy at UC Berkeley. The images are available on NASA's HubbleSite NewsCenter. The upheaval was heralded in December 2005 by a color change from white to red of a large oval near the Great Red Spot, earning it the moniker Red Spot Jr. This oval, formally known as Oval BA, formed six years earlier through a merger of three large white ovals just south of the Great Red Spot - storms that formed in the early 1930s and were prominent in the Voyager era. "One of the most notable changes we observe in both the Hubble and Keck images is the change from a rather bland, quiescent band surrounding the Great Red Spot just over a year ago to one that is incredibly turbulent at both sides of the spot," de Pater said. "During all previous HST observations and spacecraft encounters, starting with Voyager in 1979, such turbulence was seen only on the west or left side of the spot." The Great Red Spot is a persistent, high-pressure storm on Jupiter whose cloud head sticks some 8 kilometers (5 miles) above the surrounding cloud deck. Why the spots are red is a subject of great debate. Moreover, the color of several bands on the planet has been changing since the upheaval began, said Christopher Go, an amateur astronomer in Cebu, the Philippines, who joined de Pater's team two years ago. Go alerted the astronomical community in early 2006 about the color change of Red Spot Jr.
"Lately, the red color of the Oval BA has faded a little bit, while the Great Red Spot may have turned dark red," Go said. The UC Berkeley team will work with the amateur astronomy community to investigate the possible origin of this turbulence, which is not understood. The Great Red Spot and Red Spot Jr. are squeezed between bands called shear flows, where the flow above each storm is moving westward and the flow below is moving eastward. Since the shear flow in each band is slightly different, and the storms are different sizes, Red Spot Jr. drifts slowly eastward toward the Great Red Spot while the Great Red Spot drifts slightly westward toward Red Spot Jr. 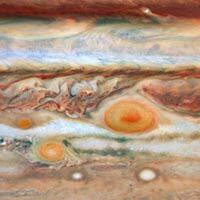 In late June, this storm will pass the Great Red Spot, as it does every two years. Interestingly, a third red spot has appeared to the west of the Great Red Spot in the same latitude band. "Although much smaller in extent, the color is striking," said UC Berkeley team member Michael Wong. ""Like the other two large red storm systems, this newest red spot is bright in near-infrared wavelengths and dark in the ultraviolet. If this spot and the Great Red Spot continue on their courses, they will encounter each other in August, and the small oval will either be absorbed or repelled from the Great Red Spot." "The appearance of the planet's cloud system from just north of the equator down to 34 degrees south latitude keeps surprising us with changes and, in particular, with new cloud features that haven't been previously observed," Marcus said. "Whether or not Jupiter's climate has changed due to a predicted warming, the cloud activity over the last two and a half years shows dramatically that something unusual has happened." "A major goal in taking the Hubble images is to look for changes in the zonal wind profile since the Cassini encounter in 2000," added team member Xylar Asay-Davis. "If we do find major changes, these could provide important supporting evidence for climate change on Jupiter." The red coloration in the ovals may be generated as their swirling hazes rise to heights like the clouds of the Great Red Spot. Detailed analysis of the Hubble's visible light data and the Keck images at near-infrared wavelengths will reveal the relative altitudes of the cloud tops of the three red ovals, de Pater said. Since all three oval storms are bright at near-infrared wavelengths where methane gas is absorbing, the data already show that all three systems rise up well above the surrounding cloud deck. The Hubble telescope imaged the entire planet on May 9 and 10 using the Wide-Field Planetary Camera 2, while Keck II focused on the area around the Great Red Spot on May 11 using adaptive optics to sharpen the image. Dr. Al Conrad, a support astronomer at the Keck Observatory, noted that the team used adaptive optics (AO) to obtain a spatial resolution comparable to that obtained at visible wavelengths with the Hubble telescope. Adaptive optics can take the twinkle out of an object caused by turbulence in the atmosphere, but to do this well, the target must be near another bright object that can serve as a reference. For some of the images, Jupiter's moon Europa was used as the reference "star." But until Europa was visible off the limb of Jupiter, a laser guide star was created near Jupiter to serve this purpose. "This was our second attempt using the laser to obtain AO-corrected images of Jupiter's surface," Conrad said. "Based on our past experience, we placed the laser beacon slightly farther from Jupiter's bright glow. With this adjustment in place, AO revealed much finer detail on the surface than we saw during our previous observation. By using the laser whenever there is no moon available as an AO reference, we will now have many more opportunities to observe Jupiter with Keck." In addition to images at 1.2-1.65 microns, where Jupiter's reflected infrared light is measured, the team also obtained a close-up of the three spots at the somewhat longer infrared wavelength of 5 microns that samples thermal radiation from deeper in the atmosphere. All three spots appear dark on the 5-micron image because the clouds obscure heat emanating from lower elevations. ''This image is spectacular,'' says de Pater. "There is an amazing amount of fine structure and numerous small ovals south of the spots. This image reveals details in the cloud opacity not seen at the other wavelengths." The W. M. Keck Observatory operates twin 10-meter telescopes located on the summit of Mauna Kea on the island of Hawaii and is managed by the California Association for Research in Astronomy, a non-profit corporation whose board of directors includes representatives from Caltech, the University of California and NASA. For more information, please visit the W.M. Keck Observatory homepage. The Hubble Space Telescope is operated by the Space Telescope Science Institute with funding from NASA. The Hubble team consisted of de Pater, Marcus, Wong and Asay-Davis of UC Berkeley and Go of the Philippines. The Keck team members were de Pater, Wong and Conor Laver of UC Berkeley and Conrad of the Keck Observatory. The contributions by the amateur network (http://jupos.privat.t-online.de/) was invaluable for this research.